One day a few years ago when my children were small I was having a very busy day. I wanted to do my whole week of errands in one day. I started in the morning, with both boys in tow and our big orange dog. We drove from one side of town to the other, I have no idea why I had so much to do, for some reason I was ambitious that day. We stopped here and there, food store, bank, post office, cafe. The promised reward for all the driving and getting in and out of the car, was that we would stop for a walk in the dog park on our way home. Let me also say that I have a pendant that I wear. It’s silver and heavy and distinct. It is a very important thing to me, I love it and treasure it. It is a precious object, to me it represents all that is love. By mid afternoon the kids and I were having fun running up and down the 1/2 mile of the dog park that is situated on the side of a little mountain with mud, brush, trees and slopes, bark chip pathways and plumes of dust and dogs, lots of dogs. It’s a city off leash dog park. We played for a good hour and finally when we were sufficiently exhausted we headed for home anticipating dinner and rest. As we arrived at our house, while getting out of the car I suddenly felt a crushing lightness at my neck. I was missing an important weight. Then I realized, my pendant! It was missing from it’s place at my chest. The chain was there, the pendant was gone. I took a deep breath, I observed that my first thought was panic and distress, oh no! Where could I have lost it? Where would I begin to look for it? I did not want to go hunting all over town, it seemed impossible. There was just no way that I could go look for it, we were exhausted. I was so tired, the kids were counting on me to feed them and help them unwind from the day. The mom job had only just begun for the evening shift. So I sat for a minute and sighed. That might be the last I see of that precious pendant. I knew I would have to reconcile that. For now I held a shred of hope against hope that it would reappear, though how that would happen was a mystery to me. It took 2 days for me to make it back to the dog park to hang that flyer up. I had little hope but one, I prayed to Baba that if he wanted me to have that pendant, if that pendant and I belonged together, he would bring it back to me. Then, I let it go, put it into his hands. I trusted him completely in that moment and dropped any attachment to finding it. Truly there was no feeling of concern anymore within me. But also there was no hope, just believing that Baba is the responsible one for bringing it back to me, and I simply need to surrender and know that it is divine grace that guides sacred things to us, not our minds or emotions and especially not panic. I hung up the single flyer and put my hands together to the sky. Thank you in advance. Time passed, a week maybe more. I didn’t think much about the pendant, feel loss or anticipation. I went on with daily life. Then one day I received a voice message. “Hi, I hope this reaches the right person, I think I may have your pendant. Call me at this number..."
I dropped the phone. Could it be coming back to me? Tears of joy and love and gratitude filled me. I tried to hold back my elation as I returned the phone call. The man I spoke with did have my special pendant! He told me how he came to have it, gave me an address and we agreed upon a time for me to retrieve the object. I knelt to Baba’s feet in praise and glory. It’s a miracle. Jai Sai! The story of how this gentleman came across the pendant is the real miracle. This is what he told me, remember it’s already several days after I have left a note at the dog park, more then a week since I lost the pendant. There are multiple entrances to the park. This man entered at the one with my flyer hanging there, still intact. He didn’t notice the flyer. He and his dog went walking, it’s an off leash park so his dog was a few paces ahead of him when the man notices that his dog has stopped and is digging in the dirt. The man goes to see what his dog is digging up, as his dog does not usually dig and he gets a flash, a shine in his eye. He see’s something in the dirt where the dog is digging. He reaches down and picks up the silver pendant. The dog dug it up from under the dirt! This is amazing on so many levels. Baba loved dogs number one. He is well known to have fed the stray dogs of Shirdi at a time when that was not a village practice. So the man has the pendant and as he is walking to the exit of the park wondering about the interesting object he found, miraculously he notices the flyer, takes it and decides to call me, a few days after he found it. He didn’t have to call me, but he did. Why did his dog dig there? Did the dog see it? smell it? feel it? 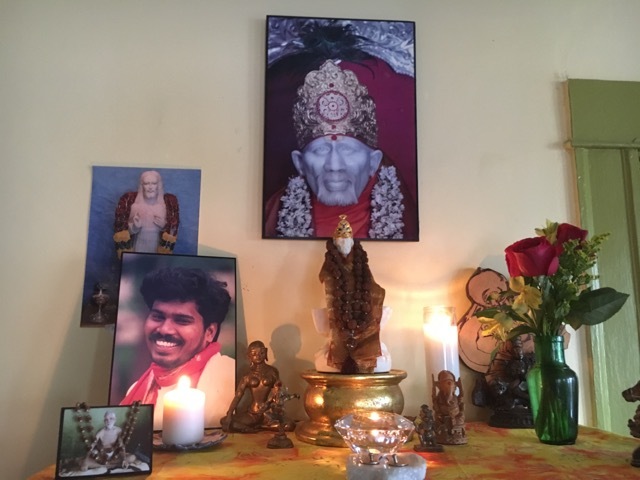 Many believe that Baba can shape shift, bring himself into the bodies of dogs, animals and sometimes other people to do his work in the world. To top to off, the man is a resident of the area. His house is right next to the park, so he walked his dog there regularly. Baba chose someone who would stop for something. If you go somewhere a lot you are more likely to notice something odd. How many other dogs had tried to tell their owners that something was there? We could never know how many people and dogs passed that pendant before this particular person picked it up. Baba is so mysterious, he is so cleaver. He knows how to get his job done. To this day I consider this pendant to be 1000x’s more special since we parted ways and returned to each other. I feel Baba in it strongly and distinctly. There is something beyond gratitude, something that is a kind of clear knowing, no words can describe. It’s soul understanding, appreciation of divine grace and the eternal essence of love and being loved. I am in awe of Baba and his leela’s. I wanted to share this story out of so many that I have experienced, because it encompasses so many of Baba’s lessons. Even that I could surrender and not panic, that was not normal for me at the time, it wasn’t abnormal, but I would have chosen to indulge in at least a little self pity and frustration at some point. This time, I didn’t do that at all, I surprised myself at my coolness. To truly surrender to the will of GOD, that is uncharacteristic of the western mind and culture, and yet I experienced it and I know this by his grace as well. I do not feel that I have lost my will by surrendering to his. For truly we have the same will, all I did was be receptive so that Baba could give me a taste of the sublime flavor of his ease and confidence. When I think on this event today, it still brings me peace, surrender and reverence.